Every offseason, the media, front offices, and fans alike start the reevaluation process as they turn their focus to a brand new season. Players will come, players will go, and some rising stars who performed well will have already made a case for more playing time. This can be interesting as, in some of these cases, it’s hard to determine if a player’s short term success was just the result of a small sample size. Sometimes a player shows just enough to make one wonder if they deserve more playing time than an incumbent. So, here’s a list of 10 players who we think have earned more playing time in 2019. Gus Edwards made an immediate impact after Alex Collins‘ foot injury in Week 11. After he took over, he earned the 10th-best running grade among qualifying running backs, and he also finished the year with the second-most avoided tackles in that span. His overall grade of 80.8 was very much higher than Collins’ grade of 61.3 and Javorius Allen’s grade of 63.1. His inexperience in the passing game limited his snaps, but the former Rutgers back should have the inside track to be the starter next season in the Ravens’ run-heavy scheme. Gerald Everett played almost half the snaps that teammate Tyler Higbee did, but he outperformed him over the course of the season. Everett had the edge as a receiver in both yardage totals and grades, but it’s his improvement as a blocker that could elevate Everett’s playing time next season. After mustering 54.7 run-blocking grade in his rookie year, Everett ended the 2018 campaign with a run-blocking grade of 74.9 which far outpaced Higbee – who is typically considered the team’s blocking specialist. After a great preseason where he earned an 80.6 overall grade at guard, some thought that Westerman had carved out a role for himself in the starting lineup. That didn’t happen, but Westerman did play 96 snaps throughout the regular season and only allowed two pressures. His 78.8 overall grade was significantly better than starters Clint Boling 61.9 and Alex Redmond 56.4, so perhaps new head coach Zac Taylor will see his value in the coming months. Ending the regular season with a 90-plus overall grade is an impressive feat, and Seahawks nose tackle Poona Ford was the only first-year player to achieve this in 2018. Ford was an absolute menace against the run in 2018, and he tied for fifth among interior defenders in run stop percentage with a mark of 12.6%. If he can improve his pass-rushing skills this offseason (his pass-rushing grade of 61.7 ranked 69th among players at the position), he will be well on the way to seeing more snaps on the Hawks’ defensive line. McManis, after a playing well as a fourth corner and a special teamer, was thrust into action after Bryce Callahan, one of the best slot corners in the NFL, broke his leg in Week 14. As his replacement, the 31-year-old did an admirable job, only allowing a 60.4 passer rating in his three weeks as the team’s primary slot corner. It will be interesting to see if McManis can replicate his late-season success against the slot going forward. Few, if anyone, made a bigger surprise impact than Anthony Harris this season. Used mostly as a special teamer from 2016-2017, he was thrust into playing time after Andrew Sendejo’s groin injury and took the starting job from George Iloka a couple of weeks after. From Week 6 on, only Eddie Jackson had a better grade than Harris (89.0) did at the safety spot. His specialty was coverage, where his 24.0 passer rating against was best in the NFL for safeties with more than 200 snaps in that span. A preseason calf injury slowed Vea’s arrival to the NFL, but when he finally broke through the ranks, he made an immediate impact for the team. 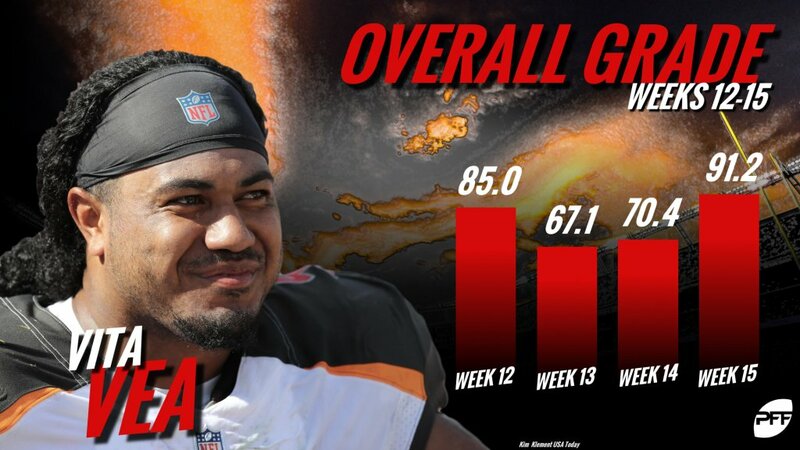 Over the last six weeks of the season, Vea’s 19 total pressures led all first-year interior linemen, and his 16 defensive stops ranked second. The Buccaneers will hope that he can carry his late-season momentum into the offseason and through to the start of the 2019 season. The former Alabama edge defender had a lackluster rookie campaign in 2017, recording 58.9 overall grade across his 194 snaps with Washington. However, with a year under his belt, Anderson very quietly enjoyed a promising season in 2018, recording both a coverage grade (88.8) and a run-defense grade (83.8) north of 80.0. If he can continue to develop his skill as a pass rusher (he tallied 11 quarterback pressures on 95 pass-rushing snaps), Anderson could be primed for a big year three in the Nation’s capital. The rookie pass-catcher made the most of the limited opportunities he received in his first season with the Jets. On just 85 receiving routes run, he picked up 143 yards on ten receptions – a respectable average of 1.68 yards per route run. 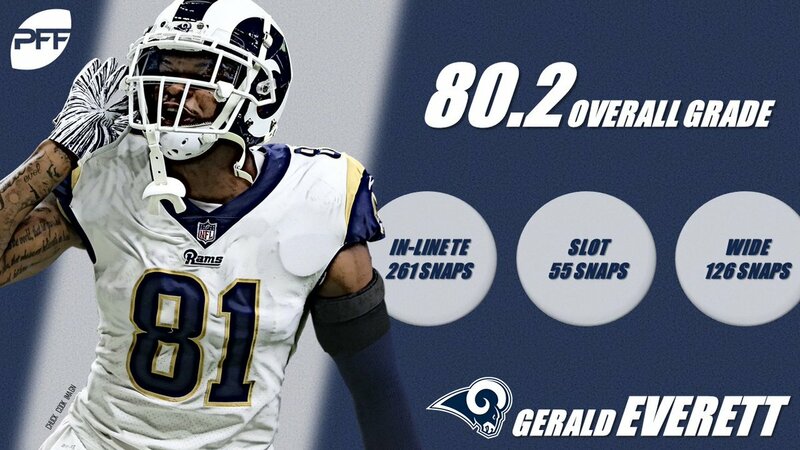 Among the 26 rookie wide receivers with at least 100 offensive snaps this season, his overall grade of 74.0 ranked first. With that performance, it appears that Burnett has earned himself more opportunities heading into 2019. The seventh-round safety played 370 of his 539 total snaps as a part of the Bengals’ special teams unit, where he racked up five solo tackles and five tackle assists on his way to a respectable special-teams grade of 74.8. It’s his work in coverage though, that gets us excited for his future. Across 117 regular-season coverage snaps, Fejedelem allowed seven receptions from nine targets, but those catches only went for a combined 54 yards, and he logged three coverage stops in the process. His 88.4 coverage grade ranked sixth among safeties with at least 100 coverage snaps, and we’re looking forward to seeing if he can keep it up in 2019.